After a couple of hours loading ammunition, I hate hand-writing all those ammo box labels. I’ve found an easier way. I buy blank stick-on labels and pre-print 95% of the content ahead of time and store them next to my Dillon 650. After reloading, I take one of those sheets, fill in a couple of blanks and stick on the finished labels. You can create your own labels (for no fee other than using their product) at Avery’s web-site or you can add a Microsoft Word plug-in. Here are the on-line steps. Purchase the blank labels for your type of printer, ink jet or laser. I like the Avery 5160 labels. I use a lot of these for many things and buy the economy-size box with 4200 blanks at amazon.com, WalMart, OfficeMax or Staples. Lots of other places have them, too. Figure out your most common load. I shoot Bullseye and have one common 45 ACP load that I make 90% of the time. For that load, I want most of “the blanks” already filled-in. Using your computer, go to avery.com. Mouse over the “Templates & Software” menu and, when it drops down, click “Templates & Software” and then select “Design & Print Online”. Design your label as you see fit. You can leave blanks or pre-fill in the values as I did. But here’s a warning: Don’t print from the avery.com program directly — it doesn’t necessarily get the font correct. Instead, save the label on your computer as a PDF — the on-line Avery program will let you do that — and then double-click that file to open it, and print from there. Reload ammunition, put them in boxes, pull out the pre-printed labels and fill-in the date and any other blanks and stick them on. You’re done! If this sounds like a good idea, here are some more suggestions. First and as mentioned above, save the label you’ve created as a PDF. That’s what the “Save” button will do at this website. 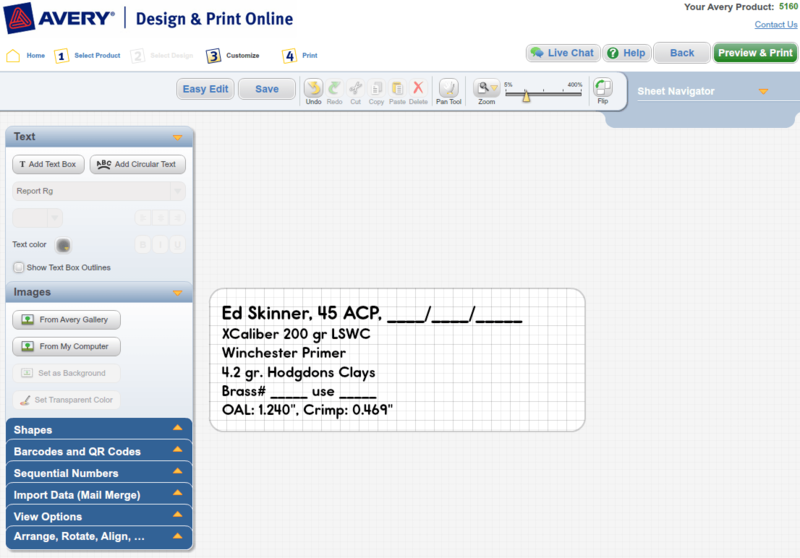 Later, you can print more of the same labels without having to go on-line and re-create the same label. Where you will hand-write something on the label, leave lots of space. Little details you almost never read can be shrunk down to 8 points. Use the Arial sans serif (plain, no curlies, not fancy) font. It’s easy to read even when small. Bold-face everything. This will make the tiny print easier to read. Leave some white space on the label so you can strike out and hand write small changes from the standard recipe or other notes. You can also download and install an extension for Microsoft Word from the same web location. This will add an “Avery” menu item to Word that essentially does the same thing but works without needing to be on-line. In the Microsoft Word addition, save your label as a “*.docx” or other type of file so you can re-print the same labels over and over again, or create variants, etc. I keep a folder on my desktop named “Print Labels” with all the different labels I have created. This entry was posted in Bullseye, Reloading by Ed Skinner. Bookmark the permalink. I’m having a great deal of trouble trying the Avery on line system. I type in the product code & I get the wrong page with 10 labels, where mine are 14 (product code says 8163). I couldn’t be bothered trying to create something in word or excel – not a computer guru. Maybe that should be 8162? 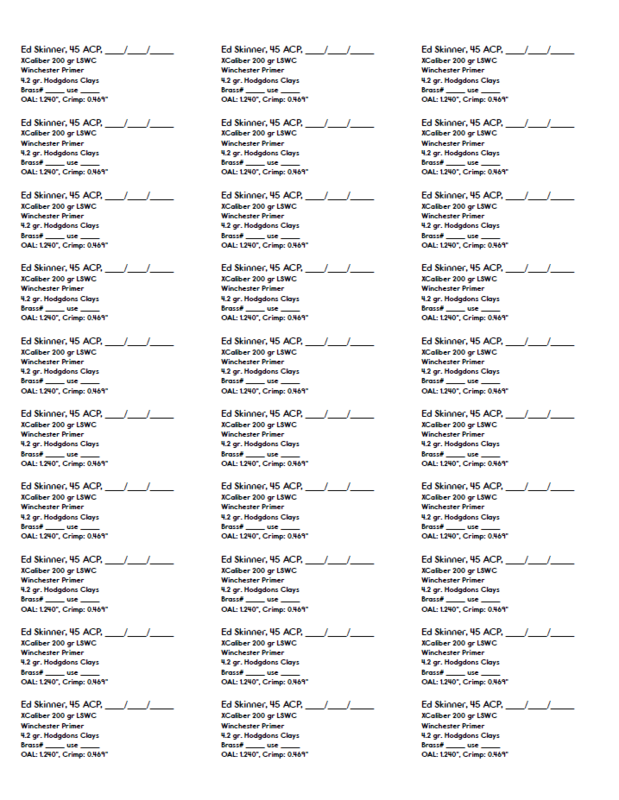 The 8162 labels have 14 per page.